It’s a pretty big park, at least bigger than I expected and there are definitely attractions suitable for all ages. You can spend hours wandering round all of the enclosures and watching the shows, and the rollercoasters such as Mantra and Kraken were up there with some of the scariest I’ve been on. As you may have realised, there is a lot to get through at SeaWorld, and if you’re only there for the day it’s worth getting Quick Queue – we did and we still didn’t manage to fit everything in! Best Ride: Antarctica: Empire of the Penguin starts of as a family-friendly ride, following the journey of a penguin and once you get off the ride you enter the penguin enclosure. I could have spent so long in here if it wasn’t freezing cold – penguins are my absolute favourite. Best Attraction: All of the shows are great, but the dolphin show ‘Blue Horizons’ topped it for me. Just make sure you get there early – we got there just as it was starting and had to stand at the back. We also spent one morning at Aquatica, SeaWorld’s waterpark. 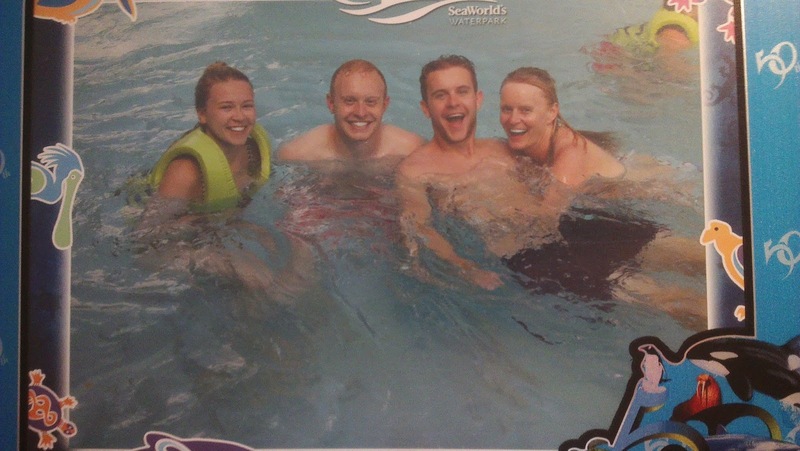 It’s a pretty standard waterpark, with a range of flumes and slides, a lazy river, rapids and wave pools, although it does have the added attraction of a flume that goes through the dolphin pool. It seemed we did it right by arriving before 9, as we got on almost every ride without having to queue too much, and by the time we were leaving at 12ish, the queues were really building up. Universal is, not surprisingly, yet another huge park, and you could spend days here trying all the rides and attractions. It’s similar to Disney’s Hollywood Studios in that much of the areas are designed to look like film sets. The resort is split into two parks: Universal Studios Florida and Universal’s Islands of Adventure. As we had two days to spend at Universal, we decided to tackle the Harry Potter areas first, as these are spread across the two parks, linked by none other than the Hogwarts Express. In the main park, the Harry Potter area resembles London, with Grimmauld Palace and the Knight Bus, but the principal attraction of this section is Diagon Alley. This area has been done really well, and the level of detail really is incredible. If you enter Olivanders, you are taken through a small tour, where two lucky visitors get their wands chosen for them. The biggest ride in this area is Harry Potter and the Escape from Gringrotts. We happened to begin queuing for this one at rather an unfortunate time, and ended up having to queue for over five hours. Yep, FIVE WHOLE HOURS. Luckily the ride was amazing and we managed to forget about the suffering in the 100% humidity that had come before. The Hogwarts Express, which takes you over to the other park, has screens for windows, so that your journey really does resemble the trip to Hogwarts. Once you arrive at the other end, you’re in Hogsmeade. Magic! Hogsmeade is similarly impressive, although it does feel a little strange to be surrounded by snow in the Florida heat. Luckily, the ride inside Hogwarts, Harry Potter and the Forbidden Journey, only had a 45 minute queue, so we zoomed onto that one. There’s also the Dragon Challenge rollercoaster, complete with loops and G-force, but I found it more painful than fun! As the Harry Potter sections had taken up one whole day and we only had a day left to do the entirety of the rest of the park, we decided to get Express Passes, but STILL didn’t get on every ride. The parks are split into different sections, including: New York, San Francisco, World Expo, Hollywood, Marvel Superhero Island, Toon Lagoon, Jurassic Park, the Lost Continent and Seuss Landing. The rides were all so great – I was continually impressed all day, especially by the innovative simulation rides that felt so ridiculously realistic. Best Ride: Harry Potter and the Forbidden Journey. I can’t even begin to explain the technology behind this ride, but it was almost half simulator and half ride on a track. Never could I have imagined that a cart going round a track and stopping at large screens would make me feel like I was flying past Hogwarts and swooping around the Quidditch Pitch, but it happened! Or maybe it was just magic. Best Attraction: Everything Harry Potter. Now that it’s all written down, I can completely understand how exhausted I was by the end of the 10 days. Fortunately for us, we were then off to St Lucia for five days of relaxation – but that’s another post to come! My advice for anyone going to Florida? If you want to do all the parks in full, go for as long as possible so that you can spend more than one day in each park and have time for days off in between, you need them. Have you been to Florida recently? What are you favourite parks and rides?